'The ghosts in your life don't ever really go away. Every so often they will whisper to you ...Don't worry about it too much.' 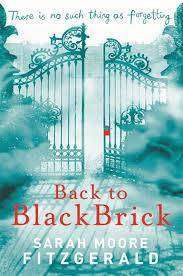 When Cosmo keeps his promise to his granddad to go to Blackbrick, he finds himself in the forgotten corner of a distant past, one that his granddad has, strangely, never really talked about. Here friendships come to life, there are new beginnings, a lifetime of memories and everything is still possible...An extraordinary debut novel with a fantastic voice. This is compassionate, humorous, moving - and tackles some big questions.